Home » Borneo (Kalimantan) » Visiting the Daily Life of Dayak Tribe. Visiting the Daily Life of Dayak Tribe. When you visit Palangkaraya city, look down from your window plane then you will see green nature that is split by small river where around it there are many mangrove trees. The river flow is similar to dragon head with a very long body. When the forest region looks clearly, the city of Palangkaraya will appear as though this city is out of tropical forest. Central Kalimantan full of tourism destination and potention of natural resources. Start from plantation, forestry, fishery, mining, and animal husbandry that will make visitors curious. Besides of that, the diversity of ethnic group and a three-major of Dayak tribe that live in this region like Ngaju tribe, Ot Danun tribe, and Dusun Ma'anyan tribe. Do you curious? If you want, please leave your routinities temporary and run to this place to enjoy the life experience by involving yourself together with they way of life of Dayak tribe. If you want to know more about Dayak tribe, please learn the traditional dance of Dayak and its musical instruments. This is the right place!! Dayak Ngaju tribe is the most popular Dayak tribe, occupy some places around Kahayan and Kapuas river, which famous of its arts. Especially the wooden coffin with grave stage and high memorial statue. Ot Danum tribe occupy some places around the river in the north of Ngaju and in the south of Schwaner and Muller mountains. Ot Danum tribe live in the ancient house with a height of pillar is about 2 - 5 metres above ground level. One house has +/- 50 rooms. This traditional house is called Betang house. Ot Danum tribe is known has a skill in weaving the rattan, palm leaf, and bamboo. They still live by following the ways of their ancestors. A tribe in Ma'anyan village still believe in spirits, agriculture ritual, and complex death ceremony. And they still rely on the ability of shaman whenever they need recuperation. The grave here shows social levels. The funeral of the high caste people is located in headwaters, followed with soldier grave, the grave of usual society is located in downstream river. The funeral for slave is located in downstream river side. You can use Garuda Indonesia directly to Palangkaraya, which fly three times a day. From Palangkaraya, you have to book a travel packet that encompass the visit to Dayak village. Even several packets include live together with Dayak people. For the accommodation, this village provide temporary residence. During you live over there, you can learn how to make handicraft or how to cook traditionally. You have to back to Palangkaraya to rent the car or book the travel packets that is will adapted with your desire. This guide will give you the prediction how long your travel to the location and what you have to do to make your travel enjoyable. Palangkaraya, in Dayak language means "holy casket". Palangkaraya is easy reached from Jakarta, Banjarmasin, Samarinda, Balikpapan, and other places in island from the air. This city has became the seat of government, commerce, and education. The local museum of Palangkaraya is filled with important collections about history and culture throughout Central Kalimantan. Here some places that you can visit after or before visiting Dayak village. Kuala Kapuas is located in Kapuas river, 40 km from Banjarmasin. A famous tourism object over there is Telo island, a fisherman village and enjoyable harbour. For the adventurer, rafting enthusiats and nature lovers, there is Rawai cave where it is known with the beatiful and challenge stream. The gold mining in Teweh and Batu Api, Rungan district is also the interesting places to visited. In this region, the gold mining is a main source of livelihood of society over there, they still use traditional methods to mine the gold. Sampit is the largest wood harbour in Kalimantan. Orchid park in Pembuangan Hulu is a place for a number of rare and beautiful orchid varieties. If you have a hobby in hunting, you can go to Kotawaringin Barat. 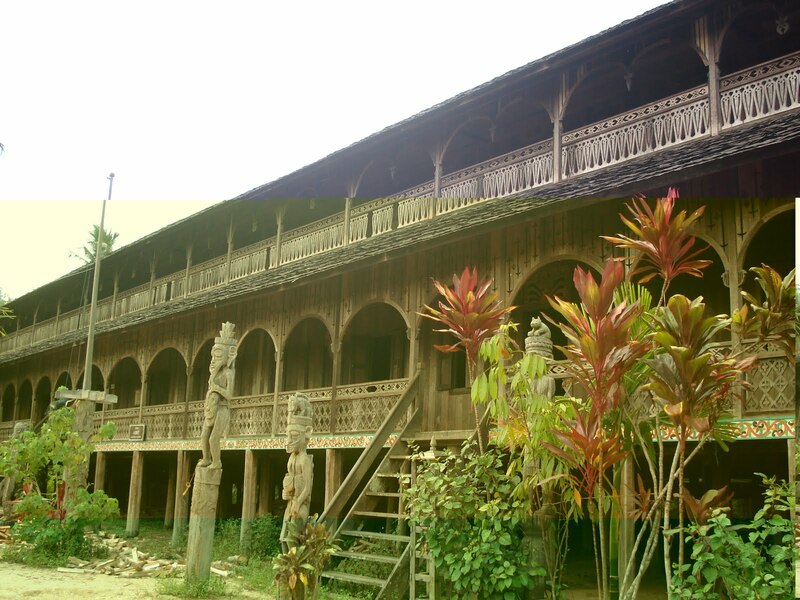 If you architecture enthusiast, you have to visit Ancient palace of Pangkalanbun, it is built by using ulin (ironwood) This is the only heritage of Banjar kingdom that is found in Central Kalimantan. If you want, you might follow some fishermans to catch fish. Their fishing technique start from using fishing rod until using unique nets. You will feel satisfy after you enjoy your catch result. Then, to complete your travel you can go to hunt deers and wild boar with locals. Dayak tribe fulfill their necessities of life by hunting around the forest, they also have unique hunt methods. They don't hunt animals by gesit but somehow those animals come to approach Dayak people. How they can do that? They have unique methods in attract attention of animal. When they hunt the deer, they imitate the sound of young deer. Because of the deer isn't always protecting its children, the female deer directly approach to that sound.In hunting, they use spear. 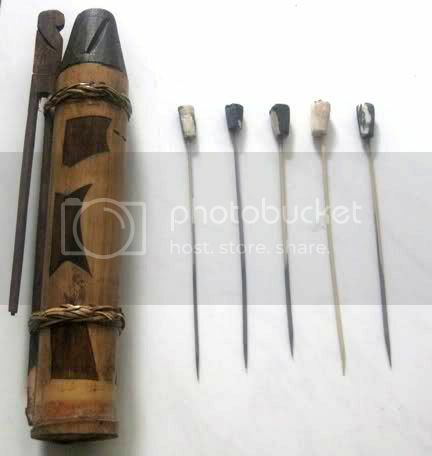 The spear has a function to catch an animals from the far distance by fling it to that animal, or it is also can used with poison needle, which is implanted into the end-spear then blown into the target.